from the top. Price includes 1 free nameplate. Additional nameplates are available. Case dimensions are 11" x 15". Perfect for an 18oz Wheaties size box. 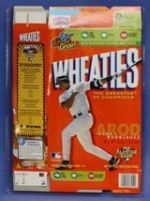 Single wall mountable acrylic cereal box display case for 18 ounce Wheaties size box. richly beveled UV protected acrylic, all handcrafted and polished to a high luster. in the protection of your memorabilia collection. Includes mounting hardware. Includes 1 free nameplate. Additional nameplates are available.